The Loss of Sony/ATV: What Does It Mean For Michael’s Legacy? And For Us? “I’m leaving Sony a free agent…owning HALF of Sony!”-Michael Jackson, 2002. With those bravely defiant words, many wondered if Michael had, indeed, signed his own death warrant back in 2002. An asset worth billions, the Sony/ATV catalog became both his greatest asset and biggest liability. It was undeniably the greatest coup of his business career and the crowning achievement of his business acumen. It also became the source of his biggest torment, as the rest of his life became an obsessive struggle to hold onto and to maintain this asset at all costs-even, perhaps, that of his own life. “They want my catalog and they will kill me for it”-Michael Jackson. “As you may recall, last October Sony triggered the “buy-sell” clause in the partnership agreement which provides for one partner to buy out the share of the other at the highest possible price. As has now been announced, the Estate and Sony have signed a memorandum of understanding for Sony to purchase the Estate’s interest in Sony/ATV. A copy of the official press release is also being sent to you. In the intervening months, we explored several options that would have positioned the Estate as the buyer, rather than Sony, and we had substantial interest from potential partners to work with us in doing so. Ultimately, however, Sony’s offer was in the best interest of Michael’s children and we made the difficult decision to accept that offer. The arrangements will further secure the financial future of Michael’s heirs. The amount that Sony is paying, $750 million, is a substantial premium on the Estate’s interest in the company after taking into account the debt of the company, the Purchase Option and other adjustments required under the partnership agreement. It is also a huge testament to Michael’s business acumen that his original investment appreciated so substantially over the last 30 years. There are several reasons that led to our decision. We will use a portion of the proceeds to repay the loan balance on monies borrowed by Michael and secured by his interest in Sony/ATV which means that after starting with more than $500 million in debt seven years ago, the Estate is now completely debt free with substantial assets in cash and other property. The balance of the proceeds from this sale, after taxes, fees and expenses, will be held by the Estate and ultimately will be transferred to a trust for the benefit of Michael’s beneficiaries. Furthermore, the transaction allows the Estate to diversify assets which, to date, have been highly concentrated in music intellectual property. We would like to underline that the sale has no effect whatsoever on the 100% ownership of the publishing on all of the songs that Michael wrote, which all remain part of Mijac Music, as well as those songs written by many of Michael’s favorite songwriters, that he acquired outside of Sony/ATV. These songs include “After Midnight”, “Love Train”, “I Got A Woman”, “When A Man Loves A Woman”, “People Get Ready”, “Great Balls of Fire”, “Runaround Sue”, the entire Sly and the Family Stone catalog and other songs. The Estate also continues to own its 100% interest in all of Michael’s solo master recordings and short films. There is no intention of selling any of these wholly-owned assets. While the sale of Michael’s interest in Sony/ATV is bittersweet for all of us – especially for those of us involved in helping Michael create this company back in 1995, the fact that we are even in this position in the first place further validates Michael’s foresight and genius in investing in music publishing. As we noted in the official press release, Michael’s ATV catalogue, purchased in 1985 for a net acquisition cost of $41.5 million was the cornerstone in the 1995 formation of Sony/ATV and, as evidenced by the value of this transaction, is still considered one of the smartest investments in music history. For the past nearly seven years, we have witnessed some incredible triumphs on the part of the estate, but there have also been a number of disturbing lows, as little by little we have seen many of Michael’s most valuable assets being siphoned off. Sure, the estate has generated millions in profit since Michael’s death, and Branca and McClain have done a mostly admirable-if albeit occasionally controversial-job of keeping the Michael Jackson brand alive and well as a contemporary commercial commodity. And they have had to do an admirable job of maintaining this ship despite a slew of continuous lawsuits. That’s the good part. But then have also been the low points-the loss of Neverland (an asset that Michael had maintained despite no plans to ever live there again), the gradual siphoning off of many of his personal belongings (when fans have clamored for years to have a permanent museum for these items) and an IRS debt of over $750 million which remains for many a troubling and suspicious question mark, especially for an estate that is easily worth that much and which has supposedly been debt free for over four years. How did such a discrepancy occur, and why is it that the amount for which the catalog was sold back to Sony-750,000,000-almost exactly matches the amount that is allegedly owed to the IRS? (Granted, it is still to be determined in court if the estate will actually have to pay this amount). Throughout the last week I have read all of the arguments from both sides of the pro and anti estate camp. I am still honestly not sure exactly what to make of it all, as I am certainly not in any position to know what it’s like to juggle multi-billion dollar assets, or to unravel all of the finagled intricacies of running a music corporation or a multi-million dollar estate. However, I do know what I feel in my heart and in my gut, and I have not been able to settle either with this decision. I will just suffice it to say that it feels like a very sad day, and I can take little consolation in all of the media attempts to somehow spin this into a positive, or as some sort of grand coup for the Michael Jackson estate. However, even with that being said, I would like to wade through, for a moment, all of the raging anti and pro estate sentiments to get to the actual truth of the matter-what this sale actually means (and doesn’t mean) for the sake of Michael Jackson’s artistic legacy, the future of his estate, and the benefit of his heirs. If you look at all of the headlines that have been spun over the past week, it would sound as if the Michael Jackson estate just gained over 750 million dollars to add to its already estimated 700 million value. Most of these articles are focusing on the obvious-that a 47,000,000 investment in 1985 has now netted over sixteen times that original investment. On paper, this certainly looks impressive-and it is. However, that “profit” has come about due to the sale of an asset that was worth billions. I am no genius at math, but even my bonehead mathematical skills have a hard time wrapping themselves around exactly how the loss of a multi-billion dollar asset (one that contained the publishing rights of over 2,000,000 songs including many of today’s top selling artists) can in any way be construed as a profit. Although $750 million is certainly a staggering sum that most of us, even in our wildest fantasies, could hardly fathom, it is a mere drop in the bucket compared to a money making monster like the Sony/ATV catalog that, ideally, would continue generating a profit for as long as all of the music of its nearly 600+roster of music artists are selling. And which, considering that this roster includes many of music’s most legendary performers as well as many of today’s hottest selling artists, that would be for a very long, long time to come. Seriously, has anyone ever bothered to actually look and see just how many music artists whose music publishing Michael Jackson owned a stake in? The list I linked to above is far too long to paste here, but even a casual glance at it is enough to blow any music lover’s brain! If one went by most of the media reports, one would conclude that the biggest names Michael “owned” in the industry were The Beatles, Eminem, Taylor Swift and a few token others who occasionally get mentioned in media articles about the Sony/ATV catalog. That is a gross under estimation. Michael’s music publishing empire meant that he not only had a stake in The Beatles’ publishing (arguably the biggest commercial selling act of all time) but also their arch rivals The Rolling Stones (arguably the richest white musicians on the planet!) and “The King” himself, Elvis Presley! This would mean that Michael Jackson-the only black American entertainer whose name is routinely grouped with these white legends as a serious contender for “Top Artist” essentially “owned” a piece of all of them, as well as having complete control of his own songs and music publishing. The list goes on to include country legends like Willie Nelson and Patsy Cline (perennial sellers) to jazz legends Duke Ellington and Miles Davis, from James Brown to Little Richard (to whom Michael famously returned his own stolen song rights) and, finally, all the way up to today’s biggest selling contemporary acts such as Coldplay, Pharrell Williams, Taylor Swift and Lady Gaga. This meant that Michael Jackson was essentially earning a profit every time a piece of music from any of these artists’ songs was bought, played, or licensed out, and in death, that was money that continued to be generated for his estate and its beneficiaries. Which is why it is even more mind boggling to think that a cash sellout of 750 million-no matter how impressive that sum sounds-could begin to compare to the gross worth of the Sony/ATV catalog! However, as a working American, I can also vouch that in the end it doesn’t matter how much your gross income may be. What ultimately matters is the net pay you are able to pocket. The money generated from such a massive asset can only be of value provided it is money that is in the clear-in other words, if it is actually generating profit. It’s no secret that Michael used the Sony/ATV catalog as constant leverage in most of his business dealings throughout the last fourteen years of his life. But supposedly all of those debts had been cleared long ago. At least, that was the spin being given. Consider this Forbes article published in 2012, which assured us then that the last of Michael’s personal debts had been paid off and that his estate was in the financial clear. The payment means that the estate has eliminated the last of Jackson’s outstanding personal debts (FORBES reported last month that Jackson’s personal debts would be paid off by the end of the year). That’s no small feat, considering the pile obligations–roughly half a billion dollars–left behind by the singer when he passed away in 2009. Jackson’s estate has been able to pay off that debt earlier than expected thanks to the enduring popularity of the King of Pop and his work, which spurred earnings of $145 million over the past year alone-Excerpted from “Michael Jackson’s Personal Debts Paid Off, Just in Time For Bad 25” by Zack O’Malley Greenburg. So…were they just blowing smoke at us back then, or was the estate truly debt free? If the estate was debt free in 2012, then why the excuse of selling the catalog now as a means of putting the estate in the financial clear? Certainly any additional debts accrued since 2012 can’t be blamed on Michael Jackson. So if the estate has gone into debt since allegedly being in the clear in 2012, just whose debts are they? When announcing the sale of the Sony/ATV stake, John Branca and John McClain, Co-Executors of the Jackson Estate, made sure to note how smart a deal this was for all concerned. Simple maths shows they have a very solid point. Buy for $41.5m. Sell for $750m. That’s an 18-times return on investment. So why did Sony pay such a seemingly inflated figure for the ATV catalogue? Because it’s considerably grown in value since 1985 – that much is obvious. But what’s also missed out in Branca and McClain’s statement is the fact that the value of this catalogue is still growing – and fast – thanks to the changing shape of the music market… particularly streaming. 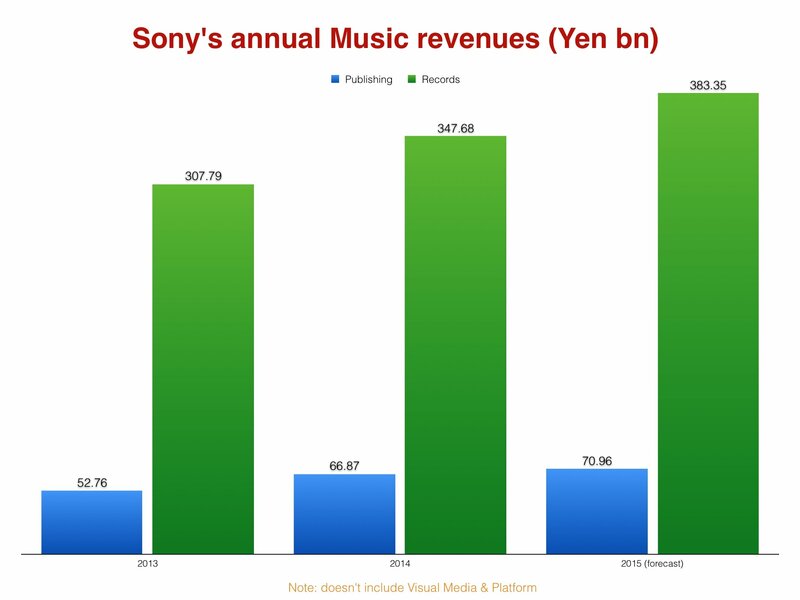 Just look at the annual revenues of Sony’s music publishing business over the past three years alone. Yes, publishing is dwarfed by recorded music income… but out of the two sectors, publishing is actually growing faster. Consider that Michael himself could have easily alleviated much of his own financial debt in his lifetime by simply selling out his share of Sony/ATV, and certainly by doing so he could have also alleviated much of the burden of stress that had come with its ownership. That he chose not to do so in his lifetime certainly wasn’t for lack of interested buyers! This is from a 2004 USA today article by Gary Strauss, quoting Charles Koppelman. And keep in mind that all figures quoted here are reflective of the catalog’s worth over twelve years ago! Jackson borrowed nearly $200 million from the Bank of America in 2001, using his stake in Sony/ATV as collateral. Industry experts value the catalog at $600 million to $1 billion, based on sales of rival catalogs in recent years. Koppelman, a veteran music industry executive, says $1 billion is more reflective of Sony/ATV’s worth. Song publishing rights are lucrative because of their increasing use in film, commercials, video games, TV shows and other venues. Like homes in hot markets, music catalogs with prime holdings continue to rise in value. It should be noted here that Koppelman was one of the original bidders for the catalog in 1984. He was well aware of its value then, and certainly more than well aware of its value twenty years later in 2004. “I want to clarify a silly rumor: the Beatles Catalogue is not for sale; has not been for sale and will never be for sale,” Jackson said in a statement released today (May 9). The Historic Day of Signing. Michael Merges His ATV Catalog With Sony To Become One Of The Richest Performers In The Business-And Perhaps Its Most Powerful. And, true to his word, Michael fought a heroic battle throughout his remaining decade of life to maintain his stake in Sony/ATV. It was an asset he had fought to keep as fiercely as Scarlett O’ Hara in Gone With the Wind fought to keep Tara, and perhaps, not surprisingly, for much the same reason-it wasn’t just its net worth that mattered to him. For Michael, that 50 percent stake in Sony’s publishing represented everything he had fought and bled for, a tangible symbol of his accomplishments in an industry in which every odd had been stacked against him as a black performer who had come up from literally nothing. For him, it represented both who he was, and everything he had fought to achieve. And it is exactly for this reason that the selling out of his stake in Sony/ATV is such a bitter pill for fans to swallow. The story is well known, but deserves repeating. Michael originally bought the ATV catalog in 1985 for what was then a mere $47.5 million, after being advised by Sir Paul McCartney that investing in music publishing would be the wisest move for the newly massively rich young entertainer to make with the millions he was generating from his massive selling Thriller album. At twenty-seven, an age when most newly rich young pop stars are blowing their money on cars, houses, drugs and women (and that is provided they live to see their twenty-eighth birthday) Michael was investing in music publishing. John Branca was instrumental then in negotiating that deal, albeit reluctantly (reportedly advising Michael at the time that it was too much money and the competition he would be facing too tough). However, Michael was adamant that this was something he wanted. It was Branca who reportedly went to McCartney’s attorney to make sure that the ex-Beatle himself had no plans to purchase the catalog. MJ fans often claim that Paul was “too cheap” to buy the catalog, but apparently there may have been a more altruistic reason as well: In a 1990 press conference, McCartney stated that he could have purchased the catalog in 1981 but refused to do so because he thought it would make him appear “too grubby” to own both his and John Lennon’s share of the songs. At any rate, contrary to the popular media spin, Michael Jackson certainly didn’t “steal” the catalog from the Beatles. Both McCartney and Yoko One were given advance opportunities to purchase the catalog, and both parties declined. This meant that when Michael made the purchase in 1985, the ATV catalog was clearly available to the highest bidder-and that bidder was Michael Jackson. Media reports that snidely comment on Michael having “outbid” Paul McCartney are blatantly false. The truth was that Sir Paul never even entered a bid for the catalog. In 1995, long before his relations with Sony soured, Michael made a monumental business decision by agreeing to merge his ATV catalog with Sony’s publishing in exchange for a 50% share of Sony’s publishing, thus forming Sony/ATV. The deal was further sweetened by the additional purchase of Famous Music in 2007, which essentially (to cut a long story very short) ensured Michael and his heirs a stake in music for films from all of Viacom’s holdings, including Paramount Pictures and DreamWorks (so, yes, it appears that in the end, Michael even had the last laugh on Spielberg and Geffen who screwed him over with DreamWorks years before!). This was also the acquisition that provided him rights to Eminem’s back catalog, as well as Beck, Bjork, Boyz To Men, Shakira, and even alternative rock acts like Modest Mouse and P.O.D. Reports on exactly how much money Michael received as a result of the Sony merger vary, but are usually quoted as somewhere between 90 to 100 million dollars. That meant that his original 47,000,000 investment had, within ten years, already yielded an approximate 50,000,000 profit! How much did the acquisition actually enable Michael to pocket off of the commercial use of these songs? A Los Angeles Times report , quoted in Taraborelli’s book, broke it down thus: If “Yesterday” earned 100,000 in royalties, the Lennon and McCartney estates would receive fifty percent, which of course would be divided into 25,000 apiece. Michael would receive the remaining fifty thousand. Although it was only a media rumor that Michael had somehow done this huge smarmy thing by “outbidding” Paul McCartney on the catalog-the media, as usual, would take their potshots at him in any way they could, as a means of deflecting his accomplishments-there is no doubt that some of Michael’s business decisions with the songs, such as licensing “Revolution” out to Nike, caused some bitter feelings on Paul’s end. When Michael Began Licensing Beatles Music Out For Commercials, It Was A Controversial Move-But Certainly Not A Decision Out Of Step With The Times. However, Michael looked at it from a very justifiable end-that Paul had his chance to purchase his songs, and chose to not take advantage of that opportunity. Also, we have to remember that by the late 1980’s, the licensing of classic rock songs-and even current hits-to commercials had become a booming business. From Eric Clapton to Phil Collins, to Whitney Houston and even Neil Young, the commercialization of familiar rock and pop jingles had become a staple of TV advertising (a trend that continues to this day). Despite reservations of his own, Michael had licensed his own music for use in Pepsi commercials. This was essentially the clash of the 60’s generation and their values vs. the 80’s generation, in which the 60’s had already become a romanticized era ripe for commercialization (especially as the baby boomers aged into the target demographic for many advertisers). Michael may have been born on the cusp of the baby boomer generation, but he was essentially a product of Generation X and, as such, very much a child of the 80’s. The sixteen year difference between his and McCartney’s respective ages was probably never better pronounced than in the rift that occurred over those Nike commercials. Michael believed that keeping the songs fresh and relevant for current youth by tying them to visible commodities was, in the end, a mutually beneficial arrangement, and in this regard, Michael was essentially no different from most of his 80’s contemporaries as evidenced by the proliferation of musicians turning to ad pitchmen during this era. To this argument, I suppose there is really no “right” or “wrong” way to view these matters-it is simply a difference of generational ideology, as the chasm that divided the political 60’s from the 80’s MTV generation grew wider. (It may, then, be somewhat ironic that thirty years later fans would protest the similar licensing out of Michael’s songs by his estate to companies like Jeep for TV and radio ads). Jackson continued his search for more music catalogs to buy, but only those with songs that meant something to him. He was shown dozens more catalogs, approaching 40 or so, but he only bid on a handful of these. Little Richard. One Of Many Artists Whom Michael Returned Publishing Rights That Had Been Stolen From Them Years Before. When Michael did choose to bid on a catalog, it was always either because they were songs and artists he personally admired, or out of an altruistic desire (as he did in many cases with artists like Little Richard and Sly Stone) to return the songwriters their rightful profits which unscrupulous record companies had stolen years before. This was an additional goal of Michael’s music publishing acquisitions that often goes under reported in the media, yet Michael was responsible for rescuing many black artists from dire poverty and returning them their rightful profits. I don’t think we can even begin to under estimate what this accomplishment meant for Michael as a black entertainer and business entrepreneur. It represented a symbolic “taking back” of all that had been stolen from black artists-not just financially, but culturally and musically as well. And even if he did love The Beatles’ compositions, the sheer fact that none of these artists would have acquired their level of fame had they not ridden off the backs of under appreciated black artists could never have been too far from his consciousness. It Was About More Than Just Money. Ownership Of The Catalog Represented A Symbolic “Taking Back” Of All That Black Artists Had Lost. MANY contracts include a clause which provides a trigger for the activation of that contract.A common example is the clause stating that an agreement for the sale of land or property is conditional upon the approval of bond financing.Another example would be a clause rendering a contract conditional upon the passing of a shareholders’ resolution on the part of one of the contracting parties. Such a clause is referred to as a condition precedent or a suspensive condition. The effect of fulfilment of that condition precedent is that the whole contract becomes enforceable.This enforceability operates retrospectively as if the contract had been unconditional from the outset.Non-fulfilment of a condition precedent normally renders the contract void. During the period after signature of the agreement and until the fulfilment of the suspensive condition, the rights (and concomitant obligations) of the parties are held in abeyance, but there is a binding agreement between them, which neither party may renounce, pending fulfilment of the condition. The suspensive condition may apply to all of the rights and obligations of the parties or only to some of them.Those that are not suspended must be met, regardless. Where the parties have not expressly fixed a time period for the fulfilment of a suspensive condition, it is implied that it must be fulfilled within a reasonable time.What is reasonable will depend on the circumstances of that particular case. If the condition is not met within a reasonable time the contract will be void, subject to the principles which are discussed below. In this instance, the “trigger clause” existing in the contract between Sony and Michael Jackson (and hence Michael Jackson’s estate) dates back to 2006 and a move that Michael himself initiated at that time. Despite Michael’s own defiant words against Sony in 2002, the truth is that he did do business with Sony again, although I personally believe it was more an act borne out of desperation than one of good will or, as they say, having “buried the hatchet.” The agreement that led to the clause enabling Sony the option of buying out his share of the Sony/ATV catalog was reached in 2006 when the company reportedly bailed him out of bankruptcy. The deal, negotiated in Mr. Jackson’s suite at the Burj Al Arab hotel, saved the singer from bankruptcy. In return, Sony took greater operational control of Sony/ATV and received an option to buy half of Mr. Jackson’s share.-excerpted from “Jackson Assets Draw the Gaze of Wall Street” by Andrew Ross Sorkin and Michael J. de la Merced. We Know How He Felt THEN. But Did Desperate Times Call For Desperate Measures? And If So, Could This Help Explain What Has Happened Now? While I certainly do not buy the media spin of Sony as knights in shining white armor sweeping in to “rescue” Michael from his financial straits, the fact remains that Michael agreed to these terms in 2006. If he had indeed filed for bankruptcy in 2006 (although to my knowledge it has never been confirmed that this was ever his intent; media reports, as always, must be taken with a heaping grain of salt) he would have certainly lost his share of the catalog, anyway. By agreeing to this deal, it enabled him to maintain this asset, but under much more precarious conditions. Not only did it mean a potentially lowered share (25% as opposed to 50%) but it also means that Sony could have opted to buy out his share at any time in the last ten years. However, despite a flurry of interest from many prospective buyers in 2009 who had their hungry eye on this golden prize, Branca remained adamant that Sony/ATV was “not for sale” -a sentiment he has expressed many times throughout the last six years. However, many fans-especially those among the anti-estate faction, are quick to point out one of Branca’s most glaring conflicts of interest-while serving as co-executor of the Michael Jackson estate, he is also a senior advisor of Sony. Certainly this would play a major hand in determining how it is that Sony-the corporation Michael hated so much that he was willing to put his life on the line to go on a major campaign against it-somehow always seems to have its hooks in him one way or another. One can only imagine how much it must have galled him to sign to those terms in 2006. But if the only viable alternative was to lose the catalog, then his decision makes perfect business sense in hindsight. Even if it came from a point of desperation, it was a decision that enabled him to keep his stake in the catalog, ensuring that himself and his children would continue to benefit from it. As usual, he was probably thinking far ahead, imagining that at some future date, he would be “back in the saddle” and in a position to dictate better terms. The agreement to this clause, while he had to have known the risks, served the purpose that was needed at the moment-it bought him valuable time. Ever optimistic, I am sure he was thinking of this as a temporary measure that would get him through the present emergency, as Michael was always certain that his next big project would put him back in the financial clear. But in so doing, it also gave him further just grounds to mistrust Sony’s motives, and contributed much to the loss of peace of mind that characterized his remaining years. Michael’s Greatest Asset…And Biggest Curse. It Brought Him Enormous Wealth and Leverage, While Systematically Destroying His Peace Of Mind. The Sony/ATV catalog became, in short, his greatest blessing and biggest curse, a metaphoric cross he carried on his back until his dying day. And many still maintain that he gave his life for it-a belief that certainly hasn’t been alleviated by this latest turn of events. For sure, the Michael Jackson estate as it currently exists has lost much of the goodwill and faith of the fan community as a result of this action. and it is going to be a long and difficult road for them now to gain it back-if they ever do. For fans who know how passionately Michael felt in his drive against Sony, and who lived with him through his fight to maintain this asset at all costs, there is no reconciliation. I understand because I have been feeling exactly those same emotions ever since the story broke. It is galling indeed to think that all of Michael’s struggles-the sheer physical, emotional and mental anguish he put himself through in order to hang onto this asset-were in vain; that in the end, it all went back to Sony, anyway. Perhaps it was inevitable that the Goliath would eventually win out over David in the end. Michael always knew, deep down, what he was pitted against. And even though many of us like to think we can second guess what his exact future plans and moves would have been, the truth is that none of us are really in a position to make that call. Michael had known since 2006 that Sony could trigger their option to buy him out, or vice versa, at any time. Given that choice in 2016, would he have opted to hang onto the catalog-even if it meant dipping into his own cash revenue and perhaps even incurring an additional debt-or would he have opted to cash in at a 700,000,000 profit over his original investment in 1985? …And David Won, For A Little While. The answer seems logical until we consider, again, the potential long term earning revenue of the catalog as opposed to a lump sum which, no matter how impressive sounding on paper, can be run through pretty quickly in the music business-all it takes is one bad business decision-one bad investment or one massive debt, to wipe it out. The truth is that we don’t know how Michael would have handled this situation, or what his future actions might have been in regard to the catalog, but if consistency is any indication, we know that he was always looking ahead to the bigger outcome. And if life circumstances had cornered him into a situation where he was forced to take the short term solution, we know it was only due to those circumstances-not because it was what he wanted, or what he knew was ultimately in his best interests. If it had been left up to Michael, he most likely would have moved proverbial heaven and earth to keep from giving up his share of Sony/ATV. I think I can speak for many of his fans when I say what hurts the most, perhaps, is simply how these matters reinforce the fact that Michael is not here to make these decisions for himself, and that it is left to others whom we can only hope are acting in the best interests of his wishes and of his children-and that, of course, is always going to be a fragile faith with few guarantees. On behalf of my wife Katherine and myself, I would like to personally thank the Executors of my Son’s Estate for a Job well done. Selling the Music catalog at the high end of today’s Market value of over 750 Million US Dollars, has secured many times over the financial future of Michael’s children: Prince, Paris and Blanket. It is every fathers dream to secure the financial well being of his children. That is what drove me to work 2 jobs in my youth while struggling to make it through the Entertainment world. Today, although my son Michael Joseph Jackson is no longer with us, I know he is looking down on his children from heaven as a proud father would, knowing he has secured a lifetime financial foundation for each of them. This is certainly a very different tune from the one he was singing in this 2013 interview with Piers Morgan! But again, if we look at the long term prospects, the children’s future just got a whole lot shakier. On a brighter note, Prince and Paris are both entering adulthood, and will soon be able to take control of executive decisions on their behalf. An infinite source of revenue has been replaced by a finite sum that can and will run dry eventually-unless the children have inherited an ounce of their father’s business savvy, and let’s hope for their sake that they have. One fact that I can offer, even though I know it is of little consolation right now, is to say this-that the loss of Michael’s share in Sony/ATV in no way changes the fact that he did own it, and that it is an accomplishment of his life and great career that is forever etched in stone. All we have to do is look at the slew of articles that have come out since the news dropped to reach one unarguable fact-one which no media outlet has been able to deny-and that is the fact that no matter how one feels personally about Michael Jackson’s move in purchasing that catalog in 1985, it was one helluva business move. What He Accomplished Is Now Part Of Posterity. No One Can Take That Away! How his legacy will ultimately be impacted by its sale remains to be seen. Like I said, it doesn’t change “HIStory”-the world knows what he did, and what he accomplished. That is the good part. Also, we have to keep in perspective that even had Michael lived, the maintaining of this asset and its profits was never an absolute guarantee. Michael would have been well aware of the 2006 terms he signed that enabled Sony to buy out his share at any time (although in all likelihood he signed it convinced that either this condition would never be triggered or that he would be in a position to buy out Sony’s share if/when it happened). Also, there is is the issue of the Copyright Act of 1976 which would enable The Beatles and many other classic acts in the catalog to begin reclaiming their full song publishing rights as of 2013. So far, I don’t think there has been a mass exodus of artists from the catalog, but no doubt the impact of this copyright act will begin to take its toll on the catalog’s profitability, unless there is a never ending supply of fresh talent signed to Sony who are equally as profitable as these classic acts have been (however, let’s not forget that this includes streaming rights, which as of right now is the wave of the future). I know it is not a reassurance that will sweeten the bitter gall of feeling that Sony has somehow had the last word and last laugh, after all. To that end, I can offer nothing except to say I share the frustration, anger, and indignant helplessness that many fans are feeling right now. I don’t think that is going to alleviate any time soon. Michael wasn’t just another super rich celebrity. He was a celebrity who had worked hard and, through dent of his own determination and drive, had built a business empire. It was an empire that had remained, even though burdened with much debt at the end, an assets-rich empire, mostly because Michael had fought and struggled to maintain many of those assets even when a cash payout on any of them could have been the easy route to take. One could argue that even his signing of that 2006 agreement with Sony-bartering with the devil, so to speak-was a last ditch effort to hang onto control of this asset, by whatever means he had to undertake to do it. This is exactly why it is so frustrating now to witness what many fans can only perceive as the gradual dismantling of that empire. If we go strictly by the legal terms of the agreement Michael signed in 2006, then his estate cannot really be faulted for Sony’s decision to trigger its buy out clause. But that still leaves three very troubling questions that fans are rightfully asking, namely how does Branca’s conflict of interest as a Sony board member figure into it; is this cash payout simply intended to settle the estate’s IRS debt, and could the estate have afforded to exercise their right to buy out Sony’s share if they had really wanted to? For the latter question, we would have to consider if the millions it would have taken for the purchase-which would have come directly out of the pockets of Michael’s beneficiaries-would have been worth the investment. Michael might have said yes, but we can’t really know and, tragically, he isn’t here to make those decisions. As for whether this is money that will go towards settling Branca’s tax debt-rather than directly benefitting Michael’s heirs-only time will tell. For that matter, just how an estate worth 700 million which was supposedly debt clear only four years ago has ended up with such a hefty IRS audit remains a troubling question as well. It is easy to feel frustrated and helpless in times like this because we all have taken pride in Michael’s accomplishments, and these losses hit us in a very personal way that I honestly do not think is shared by many celebrity fan bases. When a little piece of Michael is lost-or, as in this case, a very big piece-it somehow feels as if we have lost a tiny bit of ourselves along with it. I get that. I am feeling it, too. But looking at the overall bigger picture, fans also have to understand that when it comes to the power of corporate entities and their interests (and, yes, their greed) there is very little we can do to control that process. So (big sigh here) I have reconciled myself to taking the philosophical approach to it all. We can either expend a lot of energy ranting and raving, feeling angry and bitter over things we can’t control, or we can focus our energy on those positive things we can control. I will stress as I always have, that the best way we can move Michael’s legacy forward is twofold-to continue to celebrate his music (which will last forever) and to carry forth his work for the planet. Those are the only real certainties we have left, and in the grander scheme of things, perhaps all that truly matter. Michael’s assets, like all material possessions of any kingdom, were bound to go the way of Ozymandias sooner or later. Just as Graceland and Strawberry Fields will one day be dust, so, too, will Neverland. What will endure will be his art; the magic he gave us, and the music we will still be discussing for at least a few hundred years to come. No amount of corporate greed can ever take that away. I know these are words that sound like poor consolation right now, and they won’t drive the bitterness away over what’s been done. Nor are they intended to appease the troubling questions of whether Michael did, indeed, die for his assets. As much as there is a part of me that still likes to believe in the basic goodness and intent of human nature, I have to keep it real. We are talking the music and entertainment business, after all-and, no, contrary to the popular media spin, I do not think for a minute that Michael’s fears of being murdered for his catalog were mere paranoia. Those fears were borne out of a reality he knew, and experienced, all too well. I guess what I am really trying to say is that as fans, there is really only so much we can control, and it is pointless to waste fruitful energy crying over those things that are beyond our control. Many fans are now saying that the loss of Michael’s share of Sony/ATV was an inevitable conclusion. We were never going to be able to fight the interests of Sony; even Michael couldn’t, not completely, for all that he gave it a valiant and courageous attempt. On this, there are essentially two schools of thought, both of which have been discussed quite a bit in the last week-one being that the catalog, as a representation of everything Michael had fought for, should have been retained at all costs; the other being that, as the very thing that had caused him so much torment, is perhaps better off gone. It’s hard to know what to feel, exactly, as I can see the wisdom in both sides of this argument. And it is impossible to second guess what Michael’s own decision might have been. Some say without blinking that Michael would have never sold out; however, he did put the catalog up as collateral time and again, knowing full well the risks that would entail. Time and again, he was bailed out of those situations, but often at a cost that only meant more incurred debts-and, in the end, still no ironclad guarantee that the catalog couldn’t be taken at any time. If Michael had never signed that agreement with Sony in 2006, Sony wouldn’t have had its current option to trigger its option to buy out his share-but then, if he hadn’t signed, he stood to lose his share in 2006, anyway. It was a no-win situation that, in the end, simply appears to have bought him more time. This, of course, in no way alleviates those questions we must still ask about why the estate claimed to need this money in order to help get the estate out of the red, when they had claimed that the estate was totally in the clear four years ago. And it still doesn’t answer the troubling question of why the amount agreed upon matches, almost to the dollar, the amount that is claimed to be owed to the IRS. We might argue, of course, that none of Michael’s assets or cash would be of value to anyone, least of all his heirs, if seized by the IRS. But that only leads to even more troubling questions regarding the management of the estate, and I do think we owe it to Michael to not turn a completely blind eye to these matters. With that being said, however, I also know that it is impossible to move forward with a heart weighed down by bitterness over what’s been done, over those things we can’t control, and with vision that has been narrowed to a tunnel focus. As stated before, the only guaranteed permanent thing we ever had was Michael’s art, and this is what will be carried forth for future generations long after all the rest has been forgotten. And it is to this end that we must continue to focus the bulwark of our energy and effort. His Triumphs Were Our Triumphs, Too! It’s that acumen that helped Jackson earn more than $1 billion during his life and more than $1 billion after death, even before the Sony/ATV sale. His haul this year is already the highest annual total for any entertainer measured by FORBES. When the dust settles, Jackson’s total earnings could soon surpass $3 billion on both sides of the grave. Inevitable, perhaps. Justifiable? That’s where it gets a whole lot murkier.